Summer is winding down, but there is still so much beautiful, delicious fruit adorning the produce shelves. Finding it hard to pick just one or two varieties to bring home? 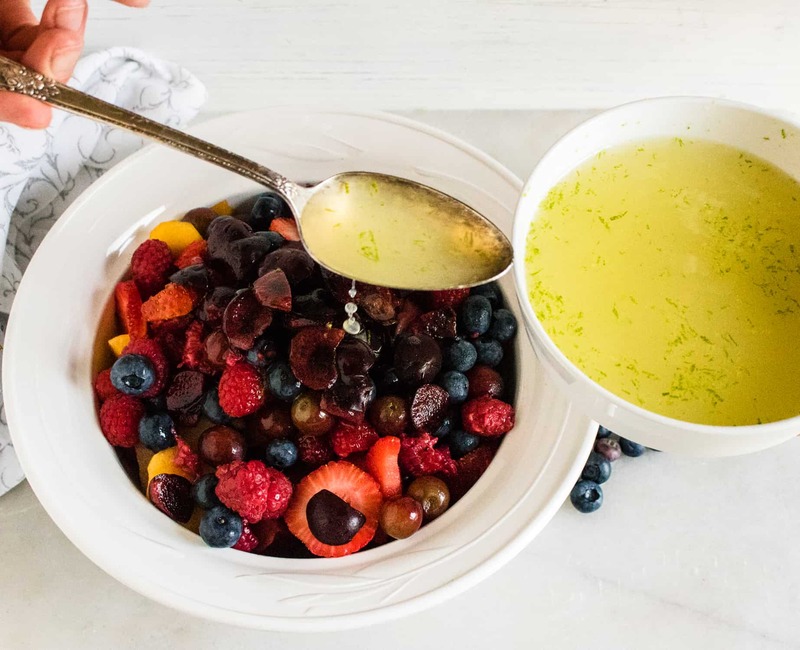 This Fresh Fruit Salad with Honey Lime Dressing recipe will solve that dilemma for you, as it calls for seven different juicy fruits! I love when someone else makes a decision for me. 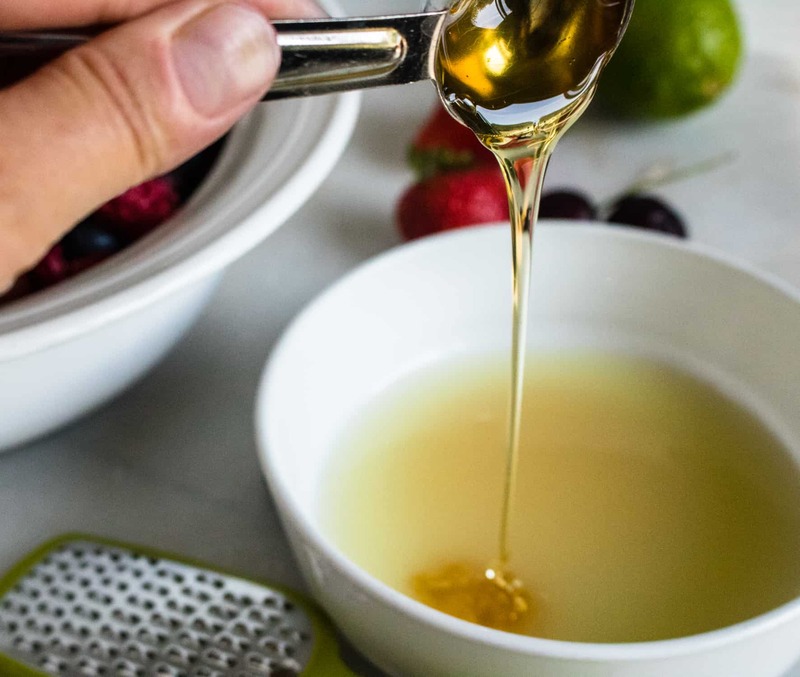 Drizzle some of this amazing Honey Lime Dressing on top and I dare you or anyone else in your family to resist indulging in this tasty treat. Each of these fruits is bursting with flavor on their own. When you put them all together it is like a beautiful symphony of juicy, sweet, tart tastes that marry together so well you will want to savor every bite. It is absolutely gorgeous to look at! My mother always told me that presentation and color in a dish are as important as flavor. This is a colorful presentation with lovely shades of orange, red, blue and purple. So inviting and so festive! 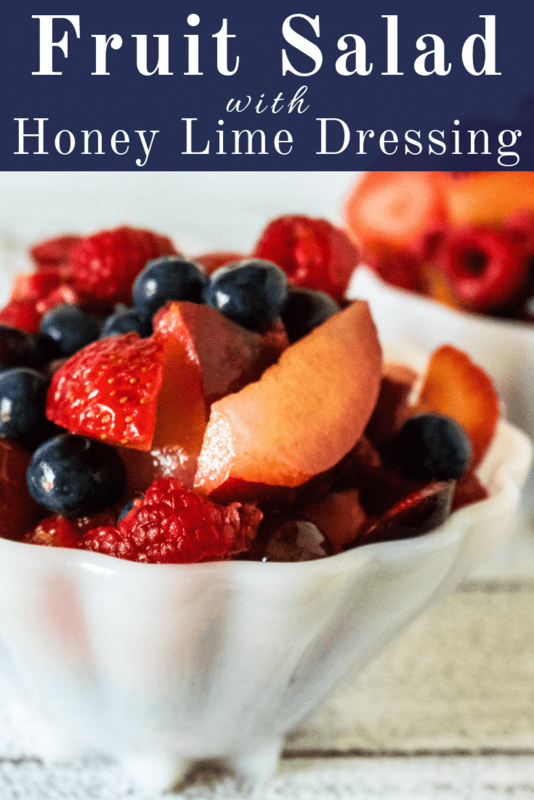 Because Fresh Fruit Salad with Honey Lime Dressing is so incredibly easy to make! 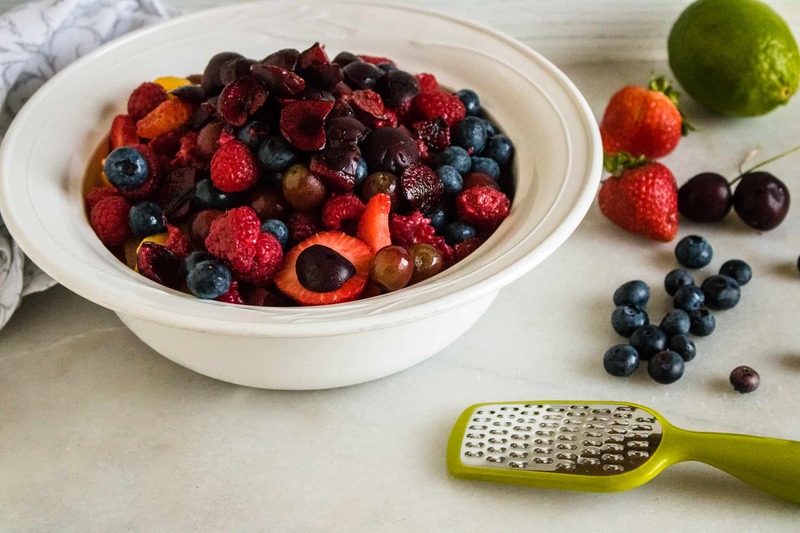 The blueberries, raspberries, and grapes can be rinsed and dropped into a bowl. Slice up the plums, peaches, strawberries, and cherries and add them to the mix. Stir together lime juice, zest, honey, and lemon-lime soda. Pour over the fruit and you’re ready to savor the flavor. 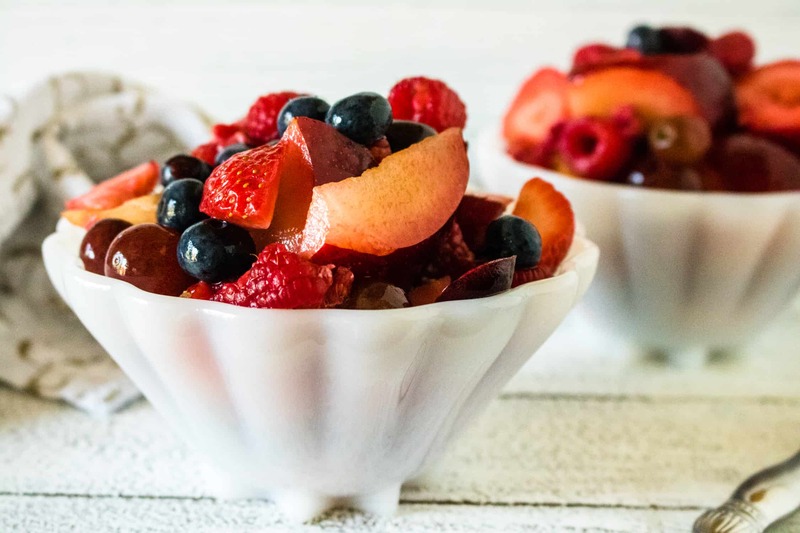 Fresh Fruit Salad with Honey Yogurt Dip gives you a healthy dose of fruit with a sweet, creamy yogurt dip. This delicious and creative Chocolate Fruit Pizza is fun and flavorful. Craving a tasty, fruity, refreshing pie? Then try this No-Bake Tropical Cream Pie. Step #1: Prepare fruit and layer in bowl. Step #2: Refrigerate for 2-3 hours. Step #3: Before serving, mix together lime juice, honey, lime zest and lemon-lime flavored sparkling water. Step #4: Pour dressing mixture over fruit and serve! Fresh Fruit Salad with Honey Lime Dressing is bright, colorful and full of flavor! 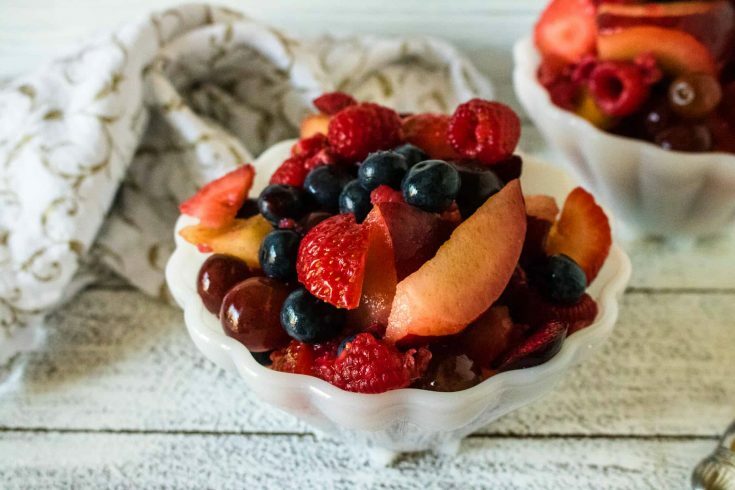 Layer fruit in bowl and refrigerate for 2-3 hours. Before serving, mix together lime juice, honey, lime zest and lemon-lime flavored sparkling water. Pour mixture over fruit and serve.